How Close Are We to Nuclear War? Former Bill Clinton cabinet member Perry perceives a danger that none of this year’s presidential wannabes have paid much if any attention to. The most recent candidate to make nuclear arms a central issue was Congressman Dennis Kucinich in 2008. President Obama has played both sides of the nuclear dilemma: rounding up and securing nuclear materials around the world, but also modernizing and miniaturizing American nuclear weapons to make them more “usable.” These days, no one in leadership – or aspiring to leadership – seems committed to actually making the world any safer from nuclear catastrophe. With rare exceptions like Kucinich, this unquestioned reliance on nuclear weapons is mainstream American military group-think, endlessly echoed in mainstream media, and that’s the way it’s been for decades. In November 2015, William J. Perry published “My Journey at the Nuclear Brink” with Stanford University Press, a short book (234 pages) with a global warning that goes unheeded and almost unmentioned in out denial-drenched culture. A quick Google search turns up no reviews of the book – none – in mainstream media. Pro forma book trade reviews by outfits like Kirkus or Publishers Weekly or Amazon make Perry’s book sound pretty bland and boring, but then so does the publisher’s own blurb. It’s as if these people are saying: yes, we know there’s a pack of wolves in the woods, and that’s not necessarily such a good thing, but we don’t want to be accused of crying wolf, and besides we’ve got our own wolves at home, and they’re trim and well fed, and they haven’t attacked anybody since 1945, so why is anyone worried? That’s Perry’s point, of course, that nobody’s worried – worse: “our people are blissfully unaware.” He doesn’t go on to argue that our people are deliberately kept unaware by a government and media pyramid that manages public consciousness for its own ends. Listen, Perry was free to publish his book, people are free not to read it, what more can one ask? That’s the nature of repressive tolerance. 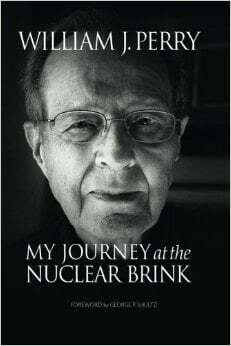 California governor Jerry Brown reviewed Perry’s book in the New York Review of Books for July 14, 2016, under the headline: “A Stark Nuclear Warning.” William J. Perry spent an adult lifetime working in the world of nuclear weapons. 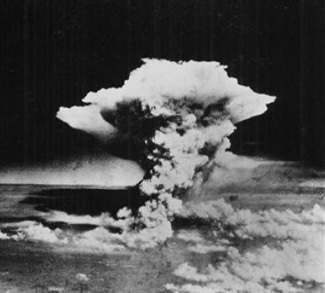 Perry has long expressed his concern that the detonation of just one nuclear weapon could produce a “nuclear catastrophe … that could destroy our way of life.” Perry has been a manager of nuclear weapons “deterrence,” which he now considers “old thinking.” The fact that deterrence hasn’t failed for more than 70 years is not evidence that the policy is successful. In Perry’s view, nuclear weapons do not provide security for anyone, and the more nuclear weapons there are in more and more and more hands, the more they endanger us all. … as a defense insider and keeper of nuclear secrets, he is clearly calling American leaders to account for what he believes are very bad decisions, such as the precipitous expansion of NATO, right up to the Russian border, and President George W. Bush’s withdrawal from the Anti-Ballistic Missile Treaty, originally signed by President Nixon. Twenty years of American stealth aggression against Russia, particularly in Ukraine and Georgia, is only the most obvious flashpoint, though perhaps not the most dangerous one. Another obvious and over-hyped threat comes from North Korea. Most countries in the world don’t have nuclear weapons, and don’t want them. Even Iran is in that group, thanks to the multi-national deal that Perry wholeheartedly approves. But in the Middle East, what threat might seem serious enough to persuade Israel – or France – to launch a nuclear strike against the Islamic State? How long will India and Pakistan, already at proxy war in Afghanistan, maintain their uneasy standoff? And how secure is the Pakistani arsenal from an Islamist government in Islamabad? Will Turkey somehow get its hands on the NATO nuclear weapons at the air base at Incirlik (still under virtual siege more than a week after the failed coup)? And then there’s China, which is not in the habit of nuclear saber-rattling. As if the U.S. weren’t risking enough in its perennial confrontation with Russia, in recent years the American “pivot to Asia” has begun to look like the early stages of another game of nuclear chicken. How many nuclear detonations would create a global wasteland? Nobody really knows how many nuclear explosions it would take to bring on nuclear winter or create the radioactive conditions to kill millions of not billions of people. Probably it would take more than ten, although ten would have a devastating impact. Maybe fewer than a hundred nuclear attacks could destroy the world as we know it. Not to worry, there are thousands at the ready around the world. The U.S. and Russia, and maybe others, have massive numbers of nuclear weapons on hair-trigger alert – believed to be a necessary element of nuclear deterrence. Rhetorically, President Obama has called for the elimination of nuclear weapons, but as a practical matter the Obama administration has reduced the American nuclear arsenal by the smallest amount in 36 years – less than any amount under Presidents Bush, Clinton, Bush, or Reagan. Under President Obama, the U.S. has maintained its aggressive policy against Russia, with one consequence being a new nuclear arms race on which the Obama administration wants to spend $1 trillion to make mass killing easier to achieve in smaller increments. No candidate for President has challenged this nuclear orthodoxy, not even Jill Stein of the Green Party. The world has more than 15,000 nuclear weapons ready-to-use by common estimate, with enough Uranium and Plutonium available to make more than 100,000 more. The U.S. has more than 4,500 nuclear weapons, Russia about 7,000, and the other nuclear weapons states have “only” a few hundred each at most (except North Korea, with a few to none). Israel, India, Pakistan, and South Sudan are the only three countries in the world that have not signed the Nuclear Nonproliferation Treaty of 1970. And what might we expect from the next American President? Republican Donald Trump seems to have published no formal policy on nuclear weapons or foreign policy. In interviews, Trump has indicated a dislike of nuclear proliferation, but has also said it’s probably “going to happen anyway,” and maybe the U.S. “may very well be better off” if countries like Saudi Arabia, Japan, and South Korea had their own nuclear weapons. He implied a willingness to use nuclear weapons against the Islamic State, or even in Europe under undefined circumstances: “I’m not going to take it off the table.” He also told the New York Times on July 20 that if Russia, for no particular reason, attacked one of the Baltic states, he’d want to make sure that they “have fulfilled their obligations to us” before coming to their defense. He did not address the U.S. treaty obligations under NATO. He has called for re-negotiating treaties that he says are too expensive for the U.S. But, in an odd and perhaps inadvertent way, his answer on the Baltic states speaks indirectly to the 20-year madness of putting Russia’s neighboring countries into the hostile NATO alliance. Trump has also spoken of pulling back forward deployments of American forces around the world, including elements of nuclear deterrence. 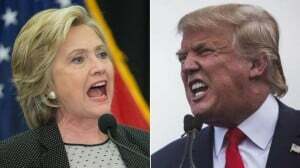 Democrat Hillary Clinton has called Trump’s positions “truly scary.” Clinton has indicated her willingness to use nuclear weapons – “massive retaliation” – against Iran in defense of Israel. She has expressed but limited support and limited opposition to the Obama administration plan to spend $1 trillion upgrading the U.S. nuclear arsenal. In an ad falsely claiming she was responsible for “securing a massive reduction in nuclear weapons,” Clinton has over-stated the impact of the new START treaty, which has been minimal in reducing nuclear weapons. As Secretary of State, Clinton appointed an utterly unqualified political donor to the International Security Advisory Board dealing with nuclear weapons. Clinton, like Trump, seems to have published no formal foreign policy on nuclear weapons of foreign policy. She has opposed the idea of Japan having its own nuclear arsenal, while at the same time falsely saying Trump “encouraged” the idea. Where is the candidate who speaks truthfully of reality? The Obama administration has built more nuclear weapons, more nuclear warheads, more nuclear delivery systems, more nuclear factories. Nuclear warhead spending alone rose higher under Obama than under any American President. In the last eighteen months, the greatest build-up of military forces since World War Two – led by the United States – is taking place along Russia’s western frontier. Not since Hitler invaded the Soviet Union have foreign troops presented such a demonstrable threat to Russia…. In Latvia, Lithuania and Estonia – next door to Russia – the US military is deploying combat troops, tanks, heavy weapons. This extreme provocation of the world’s second nuclear power is met with silence in the West. In 1996, Secretary of Defense William J. Perry was the only member of President Clinton’s cabinet who got it right, including the President himself. Perry was the only cabinet member who opposed enlarging NATO with former Soviet bloc countries. Perry was the only cabinet member then, and perhaps since, to object to the American policy of steady, stealthy, soft aggression against Russia (including the Ukraine coup) that would lead inevitably to direct confrontation between the world’s largest nuclear weapons states. Perry has called for radical change in the U.S. nuclear force structure consistent with actual deterrence, actual defense, not aggressive war. He would reduce the nuclear triad (about which Trump apparently knew nothing last October), keeping only the sea-based missiles in nuclear submarines and eliminating nuclear bombers and nuclear missiles. This would save millions of dollars and reduce the risk of accidental nuclear war. But it is heresy among the believers in faith-based nuclear policy. What I am really advocating is not so much a particular force structure, but a serious national discussion on this issue, the outcome of which has hugely important security and financial consequences — for the U.S. and for the world. Considering the huge costs entailed, and, even more importantly, the transcendental security issues at stake, we must not simply drift into a decision…. And yet the country drifts on, blissfully unaware, and it’s a mystery why a man as accomplished and respected as Perry has not done more to wake the country out of its sleepwalking incomprehension. But it may be a tragedy that we have neither a President nor a would-be President who would or could confront our potentially fatal collective denial.